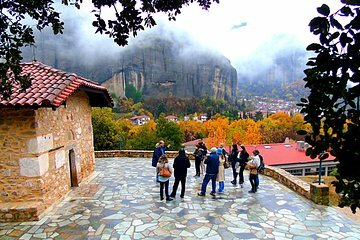 Discover the UNESCO-listed site of Meteora on this comprehensive half-day tour from Kalambaka. Learn about the local traditions, myths and history from your guide as you explore three of the centuries-old monasteries (own expense), perched dramatically on the cliffside. Combining a bus tour with brief walks, you'll have plenty of opportunities for photos of the dramatic scenery. The monasteries have a strict dress code: men must wear trousers and long sleeves, women must wear a long skirt. If you do turn up in shorts, trousers and skirts will be provided. We scheduled our tour for three adults and are glad we did. We visited 3 monasteries and it was inspiring. The tour guide was full of information and this helped a lot about the history of the area. The shuttle picks you up at your hotel which was super convenient. I know many people who go on their own to visit the area. but the tour was so much better. We highly recommend it. We very enjoyed the tour and so many different opportunities to take good pictures. The tour guide was awesome funny and knowledgeable. The trip to Meteora was our present to our mother on her 83rd birthday. We absolutely loved the monasteries and the views were amazing!!! Our guide was very knowledgeable and helpful as was the bus driver. We would highly recommend this tour. Would have liked more time at each monastery. Lovely tour around spectacular Meteora. Informative and helpful guide. It was amazing. The tour guide was so knowledgeable - Dimitri was his name. I am so sorry I was not able to give him a tip as I was the second person to get of the tourbus and it was such a rush to get of the bus as they were in a hurry to drop the other passengers off at their various hotels. It was wonderful experience! I am happy with the organisation of the tour! Great tour. Tour guides were friendly, informative and always on hand to make sure you capture best of the absolutely amazing scenery.